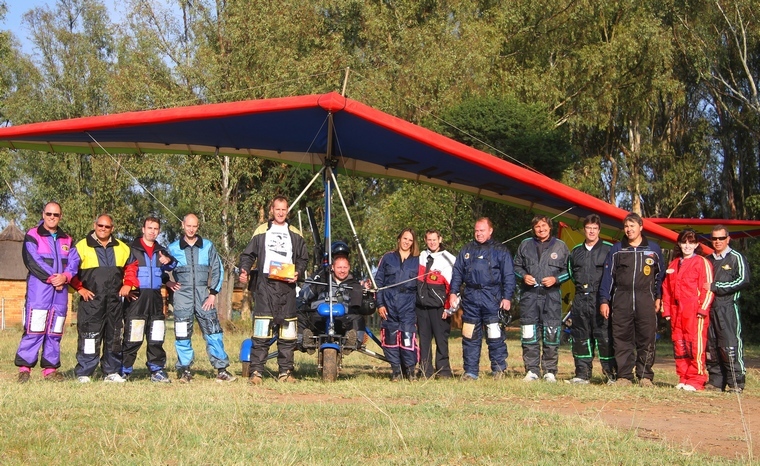 Rhino Park airfield is situated east of Pretoria just south of the Pretoria / Witbank Freeway and close to Cullinan and is the home of Rhino Flight School, Light Sport Aviation and Free Flying Adventures. The main runway, 09/27 is 850 meters long, tarred and in excellent condition and 4,780ft above sea level. Every Easter the guys of Rhino Flight School organise an Easter Egg Run when more than 500 eggs are delivered to the children of an informal settlement close to the airfield. This year 9 trikes from as far afield as Hartebeespoort Dam joined in and departed from Rhino for the short flight over the settlement. From the settlement the loose formation flew to Bronkhorstspruit dam for some sightseeing over what is one a few dams not completely taken by waterfront developments. The dam is a haven for fisherman and on the day of the flight the shores were lined with campers and anglers. The air was getting rather turbulent and since the visitors still had some way to go the flight over the dam was kept short. Every one returned to Rhino for a quick post flight briefing before the visitors departed. Make a note and join the guys from Rhino Flight School next year or fly in to Rhino Park, the restaurant serves one of the best breakfast around. The venue is also home to Motocross and Quad track as well as a Radio Control Aircraft Field.